A slight risk of severe WX is possible this Saturday Aug 27th. On another note long range models are still showing periodic gulf flow well into September. Such conditions are unusual and may offer out of season severe WX as there still are signs of gulf flow as late as October. I will be getting quite busy as the fall and winter near with my new career. During this time I can only count on getting Sundays to chase. The season so far is in line with the increasing trend of severe Alberta weather. The level of thunderstorm and severe thunderstorm development is up from 2010 which was nearly double the activity of the year before. The occurrence of severe hailstorms has nearly doubled in recent years. The cause of all the action is partly a combination of two long term weather patterns. A negative phase PDO(pacific decadal osculation) bringing in plenty of cold dry air, and a negative phase of the Atlantic/Arctic osculations bringing up hot and humid air to collide with the cold air. The setup turned out quite a bit different than originally forecast. 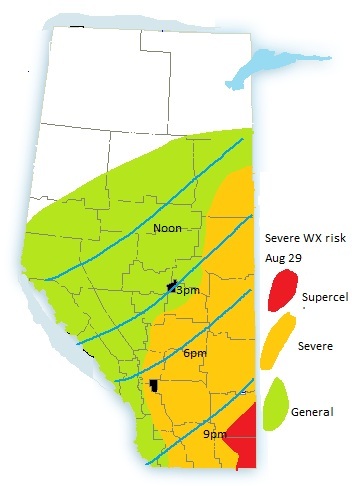 We had put the highest risk from Drumheller, to Edmonton and over to Loydminster. The storms formed up over the Wainwright, Loydminster region and west toward ares north of Edmonton. We first headed to Wainwright after 2 storms and busted when the storm hit the gas into Saskachewan, the other storm died soon after. We headed back and we were drawn to the northern storm that cycled south so vigorously it looked as if it made a 90 degree turn south from two hills. we caught up to it south of Lavoy on #36 and filmed some timelapse, we got as close to it as we could but we knew by the golf ball sized hail sitting in the ditch not to go any farther north. Fairly high risk of severe weather today with slight tornado risk. Mlcapes of 1750-2250 combined with deep shear on all levels should power some very severe storms. Risk of exceptional hail. Flash floods, damaging winds and possible tornadoes. 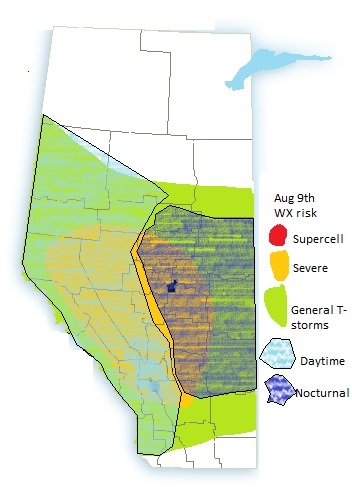 Stay tuned to albertawx for further information. Intense pulse storms will be a daily and nightly occurrence over the next few days with temps in the mid to upper 20s. These storms will be short lived and mainly hang out in the foothills and lightning triangle due to lack of shear. A few storms will pop up here and there but generally it will be calm east of the QE2 corridor. The heatwave will begin to break down by the end of the weekend and could lead to more severe supercell storms as shear increases.